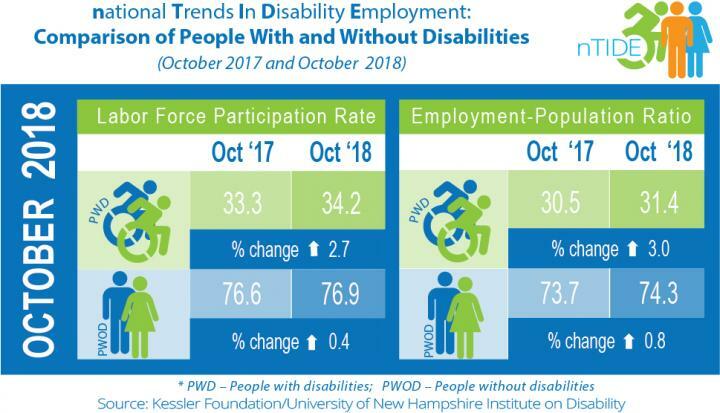 East Hanover, NJ – November 2, 2018 -The key economic indicators for Americans with disabilities continued to rise, according to today's National Trends in Disability Employment – Monthly Update (nTIDE), issued by Kessler Foundation and the University of New Hampshire's Institute on Disability (UNH-IOD). More than 50 million people in the U.S. have disabilities, comprising the nation's largest minority. As Veterans Day approaches, we focus attention on this group and its unique challenges to finding employment. Through vocational rehabilitation research, new approaches are being developed to help veterans with disabilities contribute their talent and experience to our communities and the greater economy by re-establishing themselves in the workplace. In the Bureau of Labor Statistics (BLS) Jobs Report released Friday, November 2, , the employment-to-population ratio for working-age people with disabilities increased from 30.5 percent in October 2017 to 31.4 percent in October 2018 (up 3 percent or 0.9 percentage points). For working-age people without disabilities, the employment-to-population ratio also increased from 73.7 percent in October 2017 to 74.3 percent in October 2018 (up 0.8 percent or 0.6 percentage points). The employment-to-population ratio, a key indicator, reflects the percentage of people who are working relative to the total population (the number of people working divided by the number of people in the total population multiplied by 100). "The increases in these indicators are encouraging signs for Americans with disabilities," said Debra Brucker, PhD, research assistant professor at the UNH Institute on Disability. "It's important to note, however, that large gaps remain between the employment-to-population ratio and labor force participation rates for persons with and without disabilities," she emphasized. "The October data continues the upward trend in economic indicators we saw over the past two months," said John O'Neill, PhD, director of employment and disability research at Kessler Foundation. "This continued upturn may indicate that the strong labor market, which is producing high demand for workers, is also creating labor force benefits for people with disabilities." To raise employment among veterans with disabilities, researchers are seeking to learn from the cohort that has successfully reintegrated into the workforce. "We know that the majority of people with disabilities, including veterans, are striving to work, and some are achieving success," said Dr. O'Neill, referring to the findings of the 2015 Kessler Foundation National Employment and Disability Survey. "Understanding those successes will help us develop interventions that help others reach their employment goals," he noted. Dr. O'Neill is principal investigator of a new study funded by the U.S. Department of Defense that aims to identify the factors associated with success among veterans with disabilities caused by spinal cord injury. Researchers at Kessler Foundation are collaborating with their counterparts at the James A. Haley Veterans' Hospital in Tampa, Florida. "We plan to compare the employment experiences for veterans with spinal cord injury treated in the VA system with those followed through a civilian system – the Spinal Cord Injury Model System," said Lisa Ottomanelli, PhD, an expert in veteran employment and disability and leader of the Tampa team. To capture the perspective of the veterans and the details of their experiences, the study includes interviews, surveys and focus groups. In addition to employment-related information, investigators will collect information on health, environmental factors and personal factors. Dr. Ottomanelli concluded: "Learning from the employment experiences of our veterans with disabilities is essential to attaining our goal – to formulate action plans for implementing evidence-based vocational interventions that are effective in the VA and civilian settings." Each nTIDE release is followed by a noon Lunch & Learn we inar. This live broadcast, hosted via Zoom Webinar, offers attendees Q&A on the latest nTIDE findings, provides news and updates from the field, as well as invited panelists to discuss current disability-related findings and events. On November 2, Lisa Ottomanelli, PhD, from the James A. Haley Veterans' Hospital, joins Dr. Brucker, Dr. O'Neill, and Denise Rozell, policy strategist at AUCD, to discuss VA programs that are helping veterans with disabilities enter the workforce. Join live, or watch the recordings at: http://www.ResearchonDisability.org/nTIDE. How often are cost considerations documented in clinical notes?